There is no future tense in English – just different ways of talking about the future.This means that there are only really eight verb tenses you need to remember in English. According to Wikipedia there are – at least – fifteen verb tenses in Italian. Also, we have no congiuntivo in English. With French you need to carry around a ‘Bescherelle’ of verb conjugation rules and exceptions. In English there is almost no conjugation – there are a small number of exceptions you have to remember for verbs in the present, past and past participle forms. Verb conjugation in many languages, including Italian, depends on things like the person, number, gender, tense, aspect, mood and voice. In English you only have to worry about tense and aspect (more on that later). The Italian verb system is not very different from the English one. There are auxiliaries in English, just like in Italian – there aren’t, for example, in Slavic languages. There are present and past participles, subject pronouns (although Italian doesn’t use them as much as English), and the notion of past, present and future – in languages like Chinese and other Asian languages, you have to infer the time you are talking about from the context. There are only four key verb tenses which are particularly problematic when you study English: the Present Simple, the Present Continuous (also known as ‘progressive’), the Present Perfect and the Past Simple. Once you’ve mastered this critical 20%, all the other verb forms, including the conditional and future forms, are relatively simple. 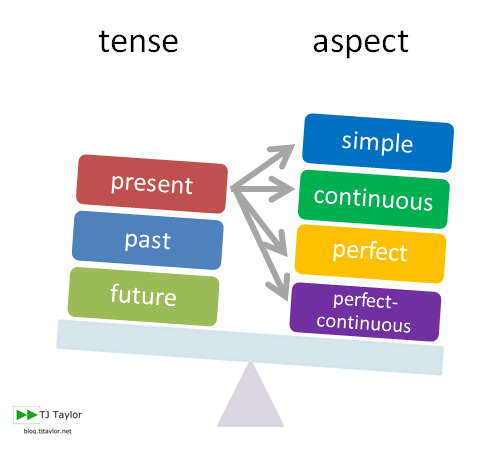 Before we explore these key verb tenses in detail, we need to understand the difference between the tense and the aspect. Tenses refer to time, the ‘past’, ‘present’ and ‘future’. Aspect refers to how the speaker views an event or action in relation to time. The aspects in English are ‘simple’, ‘continuous’ and ‘perfect’. Be careful! There are tenses and aspects in Italian too, but they are not the same. The first example is the Simple aspect and the second is the Continuous aspect, and there is often little or no difference between the two in Italian. ‘Today, I’m going to work by train.’ ? In English only the second one is correct. 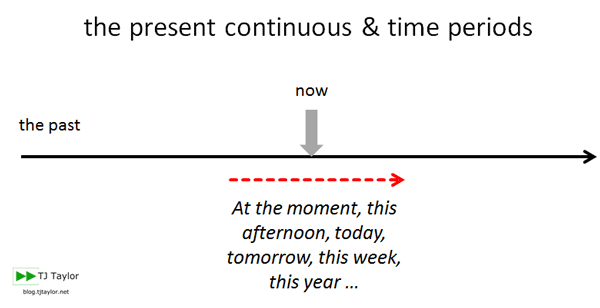 To talk about an activity or event happening right now, at the moment, today, this week, this month, this year, etc., you have to use the Present Continuous in English. I’m having lunch with clients. Can I call you back? I’m working on a really interesting project at the moment. We’re reviewing all our company processes this year. The Present Simple is … not simple. It’s one of the most confusing tenses to understand when you’re learning English, but if you get this one right, the rest is easy. As a non-native speaker of English you can make yourself understood without using the correct auxiliary or word order when you ask questions. But don’t you want to make a good impression? A bella figura? If you can master the rules for using the Present Simple correctly, your English will sound 80% better. We use the Present Simple to make generalisations, to talk about truths, to express opinions, to talk about routine or cyclical events. Without it we would not be able to discuss philosophies, concepts and theories. Incredible, absurd, crazy – but true! We use the Present Simple to talk about facts, general truths, generalizations and routine. I don’t work for Siemens any more. Now I work for Procter and Gamble. I often go to the mountains for the weekend. The plural of ‘sheep’ is ‘sheep’. You must always use a subject pronoun (I, you, he, she, it, we, you, they) – always, no exceptions, even in questions and negatives – in all tenses. Vado al lavoro in macchina. Vuoi un passaggio? I drive to work. Do you want a lift? Dice che partiamo alle sei. He says we leave at six. The auxiliary ‘do’ is used to make questions and negatives, but not positive sentences. Do you like wine? I don’t drink alcohol. I love Italian wine. When the main verb is the verb ‘to be’, you don’t use the auxiliary ‘do’ in questions and negatives. How old are your children? They are 8 and 10. They aren’t old enough to travel alone. In Italian, word order is quite flexible: you can say ‘è un vino buono,’ and ‘è un buon vino.’ Also, the same sentence, for example ‘vai al lavoro in treno’, can be a positive observation or a question.In general, rules about word order in English are not optional or flexible – for example, ‘adjectives always go before nouns’. Always. Word order tells you if you are asking a question or making a statement. Pay attention to the exact order of the subject, auxiliary and verb in the negative and question forms. You travel to work by train. You don’t travel to work by train. We often use adverbs of frequency with the Present Simple, such as always, often, sometimes, rarely, never, etc. Again, the word order is not flexible. Do you often travel to work by train? In the 3rd Person Singular of the Present Simple, we have to add an ‘s’ (or ‘es’) to the verb; in questions and negatives, the auxiliary ‘do’ becomes ‘does’. I walk to work, you take the bus to work, but he drives to work. How do you get to work? How does he get to work? It seems redundant, and designed to complicate things, but it is not optional. Native speakers of English sometimes speak ungrammatically and make mistakes, but they never, ever forget to use this ‘s’. How do they know how to do this? Because they all do it, they grow up listening to people speaking and pick up the habit of using this ‘s’. You need to develop the habit as well. NOTE: It’s not sufficient to write the ‘s’ on 3rd person singular verbs in the Present Simple, you also have to pronounce it. English is not like French, where the ‘s’ at the end of a word isn’t always pronounced – you have to pronounce them all, in the 3rd person singular and in plural nouns. Going back to the 80:20 rule, the difference between pronouncing the s and not pronouncing it might seem unimportant to you, but to a native English listener, you will sound 80% better, more fluent and more competent. it’s important for Italians to remember that there are clear and important differences in English between the Present Simple and the Present Continuous. In Italian you can use the simple and continuous aspects interchangeably – but not in English. In Italian you have two tenses to distinguish between the recent and distant past, the Passato Prossimo and the Passato Remoto. In English we don’t have this difference. We use the Past Simple to talk about things that happened five minutes ago or 100 years ago. We use the Past Simple to emphasize that the action is finished, past, over. Sometimes, but not always, verbs in the Past Simple are anchored to the past with expressions like ‘five minutes ago’, ‘five hundred years ago’, yesterday, this morning, last year, etc. The problem for Italians is that the Present Perfect is structurally very similar to the Passato Prossimo. WRONG: My first job was in Spain. I’ve worked there for a year. CORRECT: My first job was in Spain. I worked there for a year. *NOTE: the auxiliary for the Present Perfect is only and always ‘to have’. Here you are using the Present Perfect to talk about something that is past, finished, over, done. You need to use the Past Simple here. WRONG: I live in Milan all my life. CORRECT: I’ve lived in Milan all my life. When the period of time you’re talking about started in the past and includes the present, sometimes indicated by time expressions like ‘up to now’, ‘since’, ‘so far’ and ‘lately’, you need to use the Present Perfect. Your focus is not on the exact point in time when the action or event happened: but on the period of time that you refer to and what you’ve accomplished (or not). You use the present perfect to talk about periods of time that connect the past to the present. The period of time is still current, still happening, NOT over, not finished. Understanding what information you are emphasizing, and what time frame you’re talking about is key to knowing when to use the Present Perfect or Past Simple. 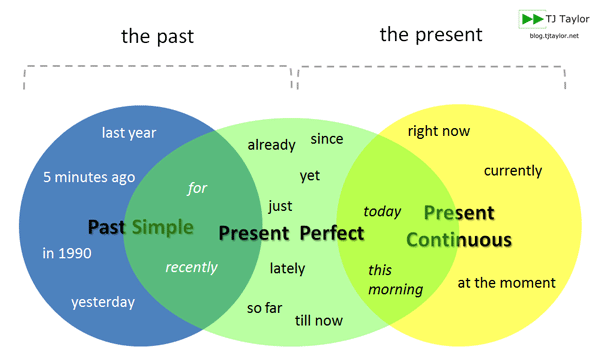 Here is a graphic summary of some of the different time expressions you use with the Past Simple, the Present Perfect and the Present Continuous. It shows time expressions which are unique to each tense, for example, ‘last year’, ‘so far’ and ‘at the moment’, or associated with two of the tenses, for example, ‘recently’ and ‘today’. You can also see how the Present Perfect provides a ‘bridge’ between the present and the past. It’s not enough to read about how to use these key tenses – now you need to practice them! If you use the four key English verb tenses correctly, people will understand you more easily, and you’ll sound much more fluent – up to 80% more! The 4 key English verb tenses are: the Present Simple, the Present Continuous, the Present Perfect and the Past Simple. We use the Present Simple and the Present Continuous to express very different ideas – the Present Continuous is for talking about the present time, now. The Present Simple is for talking about general truths and routine. The Present Simple is not ‘simple’ – there are 5 things you need to remember to use it correctly, such as the ‘s’ at the end of 3rd person singular verbs. The Present Perfect looks very similar to the Passato Prossimo, but in reality it’s very different. In English we only use the Present Perfect to emphasize activities and events that happen in time periods that stretch from the past to the present. Which of these tips about using verb tenses did you find the most helpful? Is there anything that could be clearer? Please let us know in the comments section below – and if you think your friends need some help with their English grammar, why not help them out and share this post!